AMAZING Benefits of Making Slime with Kids (You Need To Read This)! You might have noticed, fidget spinners have sort of come and gone. The media has lost it’s interest in the crazy phenomenon that swept the nation last year. However, making homemade slime has stuck (maybe a pun intended there), and for good reasons too. It might not seem obvious with all the crazy slime videos out there that the amazing benefits of making slime with kids is a real thing. THE BENEFITS OF MAKING SLIME DEMYSTIFIED! I am a slime mom through and through. 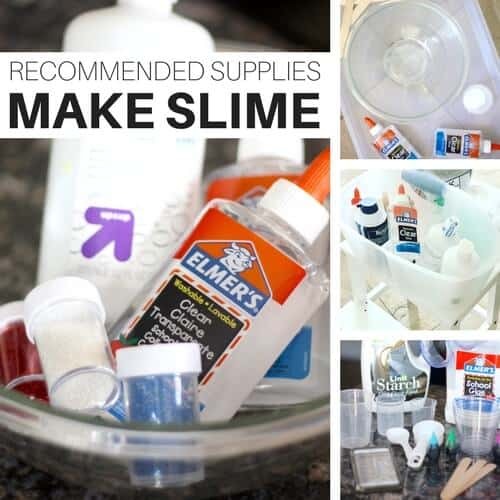 In fact that’s what one reader called me in an email where she was asking for slime making advice….Yes, I do answer those emails because frankly I am proud of my slime recipes. They REALLY work, and I want you to be able to make easy slime recipes too. Your slime doesn’t have to be Pinterest worthy, but I will help you get it there! SLIME BENEFITS YOU DIDN’T EVEN REALIZE ARE SO AMAZING! There are 3 distinct benefits of making slime with kids among the dozen I could rattle off. I don’t think that slime gets a fair rap because media always manages to pick up on the bad stuff of a trend and repeat the crazy stuff for viral posts and shares. 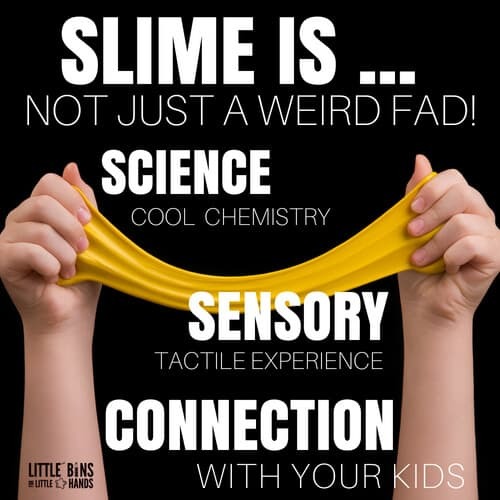 Slime is so much more then a fad, obsession, trend, etc…..
People ask me all the time what I see in slime, so let me tell you the three BEST things that come from making this slimy substance with your kids. Aren’t you always looking for ways to further develop your connection with your kids? How about accomplishing that by joining them in something they love doing. Show them you’re interested in what they love, and you have an instant connection. A lasting connection too. Making slime is not just something to do. It’s a potential gateway to fun and healthy conversations with your kids, but it’s all in how you perceive slime making. If you think it’s silly and useless, you lose the chance for a connection. 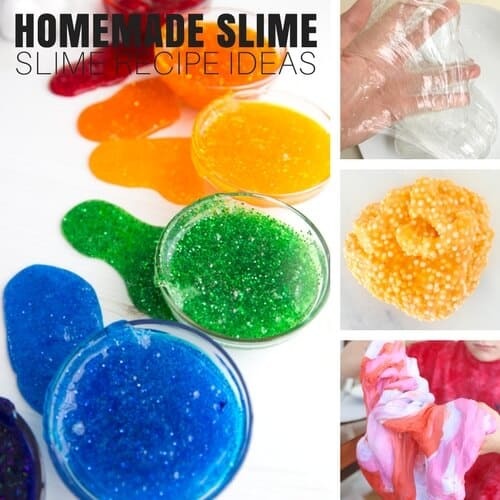 If you run with it and learn how to make awesome homemade slime right along side them…. Instant connection. Your kid(s) will know you get them and want to be a part of their world. Who knows they might even come talk to you sooner when they are having other problems. Slime doesn’t sound so bad does it. Let me help you make slime without struggling so you have more time to connect with your kids! Our slime recipes are quick and easy to make with a few simple ingredients, 5 minutes (more if you play too)! It’s fun to fit into those busy days when you just want to steal a few extra minutes with your kiddos. 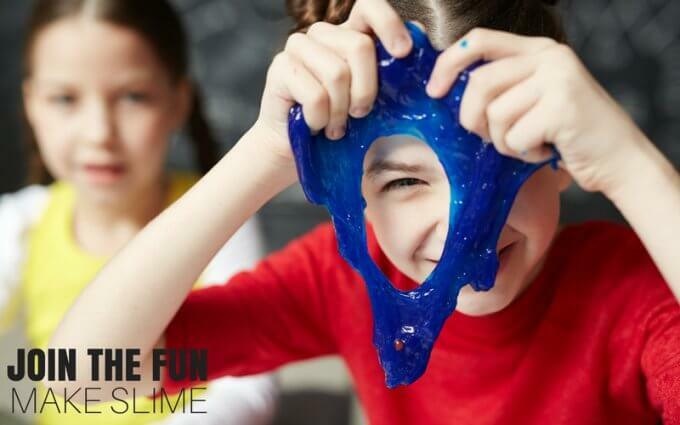 Let’s just say kids LOVE the AMAZING tactile sensory experience slime provides. Squishy and stretchy things like homemade slime just beg to be touched! Tactile activities like slime making are a treat for the senses. Kids are engaging their sense of touch! For so many kids, slime can be such relaxing, calming, regulating activity. That’s exactly why they gravitate toward making it! Have you ever squished slime? If you haven’t, get in on the fun right away. You are missing out! Some kids like to keep their hands busy and this also helps them to focus. Slime is an awesome stress relieving tool, and it makes an awesome brain break for school work! Teachers have emailed me about their slime stations at school for sensory breaks! Kids who need extra help with sensory processing work will love slime too! Slime is for everyone. However, it’s important to listen to your kiddo when they tell you it doesn’t feel good to them. We have firmer slimes and stickier slimes. Not everyone likes all kinds of slimes. Email me if you have questions! DISCOVER THE SCIENCE BEHIND SLIME AND YOU WILL BE HOOKED! The third important and amazing benefit is that making slime is actually educational too. 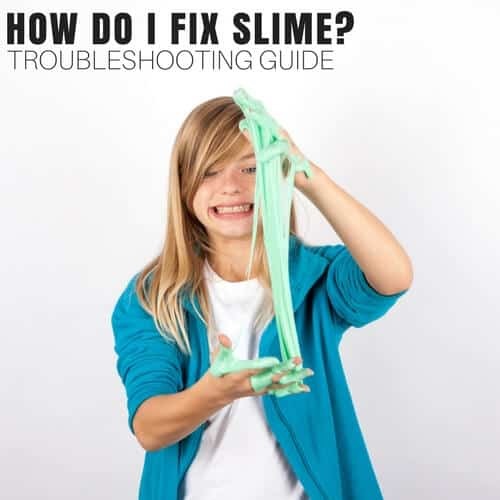 While you are working on the #1 slime making benefit from above with your kids, throw a little science in too. 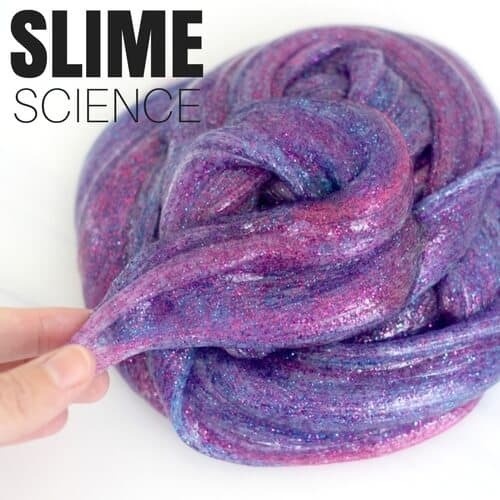 While your hands are busy mixing slime, adding , glitter, squishing, and stretching talk about the unique chemical composition that makes up slime! Talk about the ingredients you are using and why, when combined, they form this rubber substance known as slime. 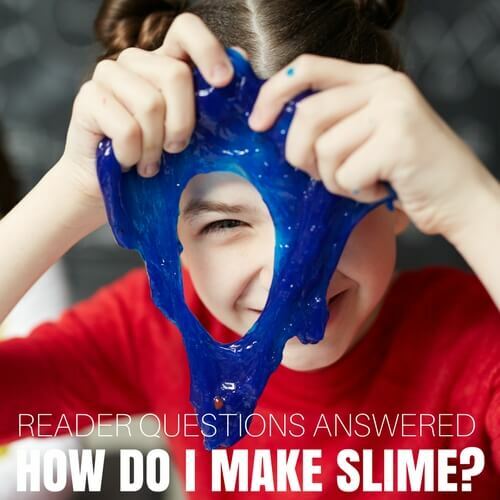 Mixtures, molecules, polymers, viscosity, reactions, and tons of great science vocal words are just waiting to be explored while you make homemade slime. As a fellow slimy parent, I encourage all of you adults out there who have kids, work with kids, and love kids to join them in their slime making fun! Instead of sending them to their room, a friend’s house, or the basement, ask them to show you what they are doing instead. JOIN THEM! Better yet, impress them with your AWESOME slime recipes and be prepared to earn super hero status in 5 minutes. That alone is worth it. slime making is screen free too! By this point you are hopefully thinking, show me the BEST slime recipes! Below you will find all the resources you need to get started. 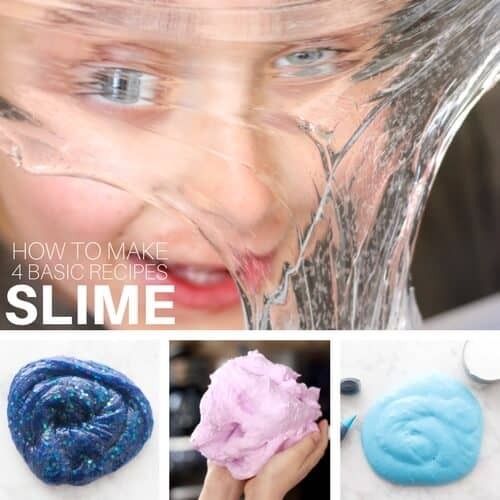 We have 4 basic slime recipes that you can literally create 100s of themes from. 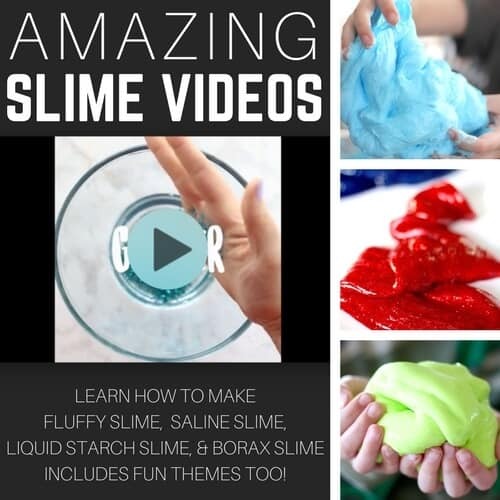 These include the saline solution slime recipe, liquid starch slime recipe, fluffy slime recipe, and borax powder slime recipe. We also have the most popular recipes kids want to be making right now like crunchy slime, butter slime, and cloud slime (to name a few)! Click on the photos below to see all the different kinds of slimy resources we have available. Join our mailing list for lots of slime freebies and information on upcoming slime books! THE BENEFITS OF MAKING SLIME ARE RIGHT IN FRONT OF YOU!